It runs on Windows Mobile 5 and 6 based PocketPCs. Copy the CAB file to your device and double click it. The program is installed to \Program Files\HushSMS\HushSMS.exe. 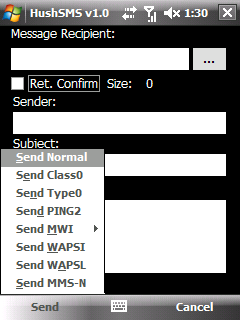 – To send a normal sms, leave the checkboxes for “Class 0” and PING unchecked. If you want a receipt enable the “Return Confirmation” checkbox. 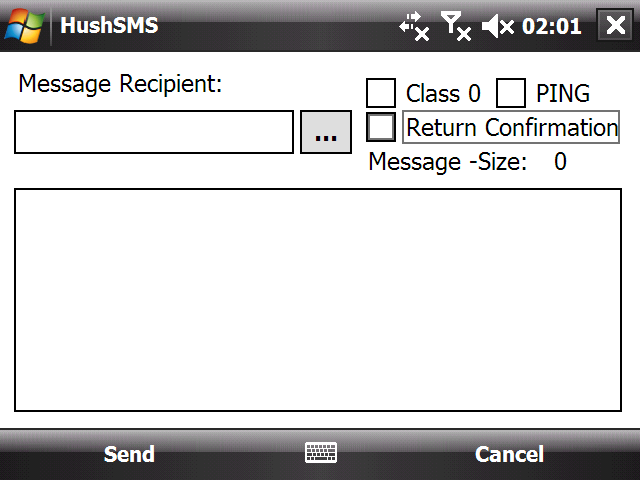 – To send a class zero message enable the “Class 0” checkbox and write your message. – To send a silent PING just enable the “PING” checkbox. There is no need to write something in the Textbox, because the target phone will discard it anyway. That’s it. Enjoy it, as always it’s freeware. which allows you to send “anonymous” messages since most target devices fail to properly display theoriginator number. Due to lame coding the message size for a WAP Push SL, SI and MMS Notification with modified sender and subject fields MUST NOT exceed 91 chars in total!!! DON’T USE THIS FOR EVIL!!! Make sure to uninstall previous version first! 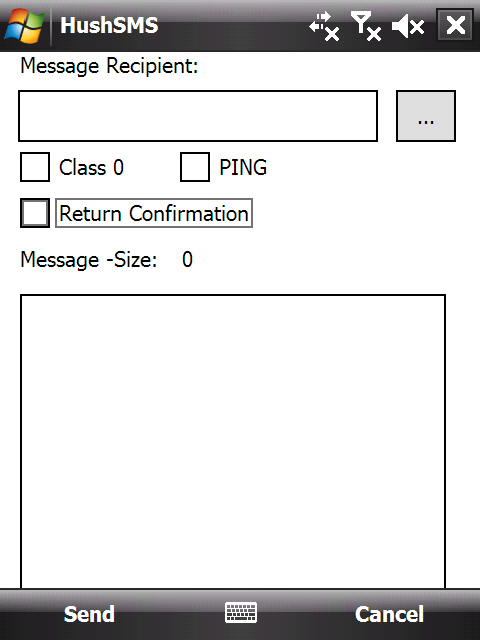 – Added PING2 function for environments where operators disallow Type0 messages. PING2 send a VoiceMWI deactivation message which is received but dropped silently by the target phone.